Crap & Couture: MAN OF STYLE: DOUGLAS FAIRBANKS JR.
MAN OF STYLE: DOUGLAS FAIRBANKS JR. I recently attended an auction preview at Doyle New York showcasing The Estate of Douglas Fairbanks Jr. And let me tell you after a week of checking out what passes for fashion it was a real pleasure to see first hand how a true man of style and elegance dressed. Forget faded “trendy” jeans and tees, Fairbanks knew the appeal of a simple pair of slacks, turtleneck and blazer. Well, it probably didn’t hurt that he was gorgeous. Boy, do I wish that men would dress like that today. I don’t care what anyone says, clothes do make the man. Some of the clothing, footwear and accessory highlights included a sport jacket in brown/turquoise grid plaid tweed with elbow patches, olive plaid corduroy pants (no they’re not flashy), and a navy pinstriped double-breasted suit. Ralph Lauren, eat your heart out! Okay, maybe your wardrobe needs don’t include a velvet collared black wool evening cape with braided frog closures, but boy would this dashing number stop traffic. While I did notice many gentlemen going through the clothing My eye was drawn to the footwear and accessories particularly the suede tassel loafers, brown and white spectators (very Fred Astaire) and any one of the cufflink sets. Since I adore hats I paid particular attention to a group of fedoras from my favorite British hatter Lock & Co. What? A girl can’t wear a man’s hat? I do it all the time ( and if anybody’s interested I wear a size 7 ¼ and I prefer a center dent trilby but I’m not proud when it comes to gifts). While my interest in viewing the exhibition was based on Fairbanks’ sartorial style I was fascinated by all the other memorabilia from the vintage photographs of Hollywood’s leading ladies to his extensive library of classic authors and paintings. In the latter category I was charmed by “Palm Beach Garden with a Self Portrait of the Artist”. 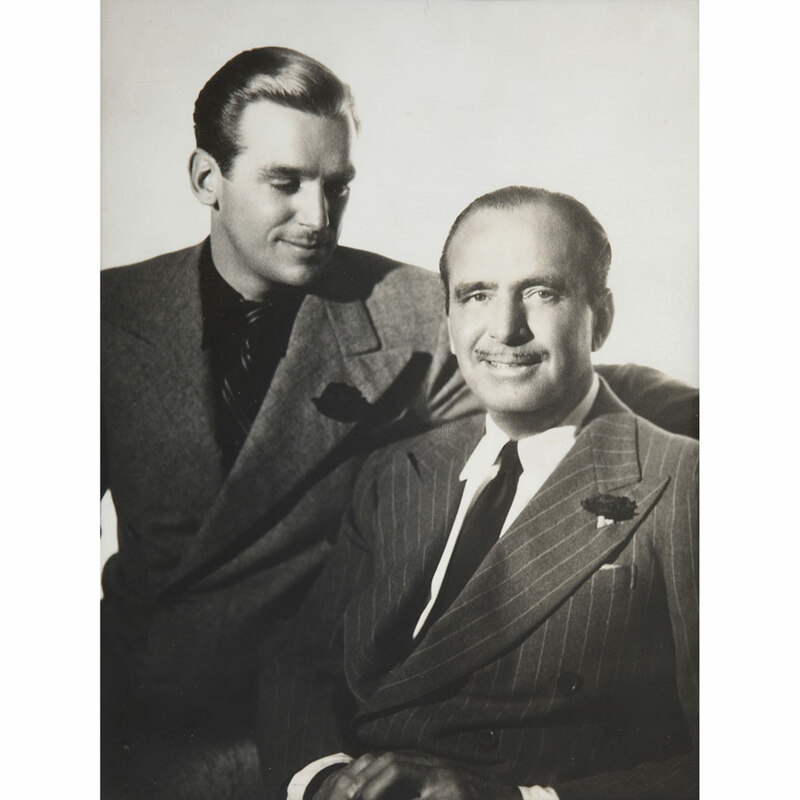 However if I cold have just one item from the auction it would have to be #245, a gelatin silver print of Douglas Fairbanks Jr. and Sr. seated together. The loving expression in his eyes as he looks down at his father is truly special and one I won’t soon forget. For info on upcoming exhibitions contact: doylenewyork.com. Having sense about fashion is the one thing and using it for the specific event is the second most important thing. This should be in the sense from which you have been talking about.